These classic shows may not know it’s Christmastime, but their holiday alternatives are every bit as festive! It’s that time of year again, where hundreds of completely made-up characters celebrate the biggest holiday of the year. But does it really make sense for almost every fictionalized universe to subscribe to Judeo-Christian tradition? In the animated Rambo series’ Christmas special, Santa was a reformed war criminal, but still celebrated Jesus’ birth. Doug Funnie’s world includes bipedal dogs and technicolored humans, yet in the Doug Christmas special they still have a white Santa and (presumably) a Jesus Christ who’s somewhere between peach and mauve-colored. Somehow in these extremely different worlds, Christmas still exists in the exact same form it does in our own reality. Meanwhile, some fictional worlds have developed their own holidays analogous to Christmas, while others have developed alternatives in a form of protest. Whatever the case may be, we’re a bit jealous that we don’t get to celebrate these in addition to the gift bonanza that is Christmas. Despite the presence of many informed 20th century heads in jars, the citizens of New New York and the world at large have all but forgot the Reason for the Season; Santa bringing presents. In what has to be the worst case of purple monkey dishwasher in history, the mythos of Santa Claus and Christmas has been twisted to the point where celebrators cut down pine trees and barricade themselves in their homes avoid the evil gaze of Robot Santa on the holiday known as Xmas. 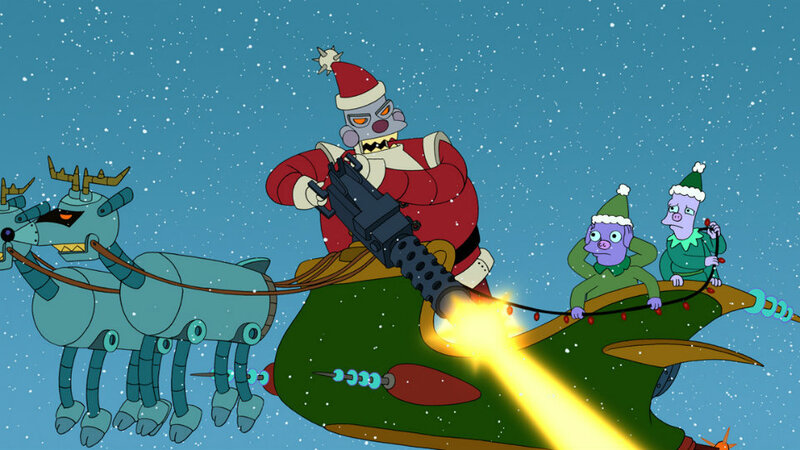 In the Futurama episode “Xmas Story”, Robot Santa persecutes all of humanity every holiday season, gunning down the impure for their transgressions, no matter how slight (thanks to a very judgmental naughty/nice filter). 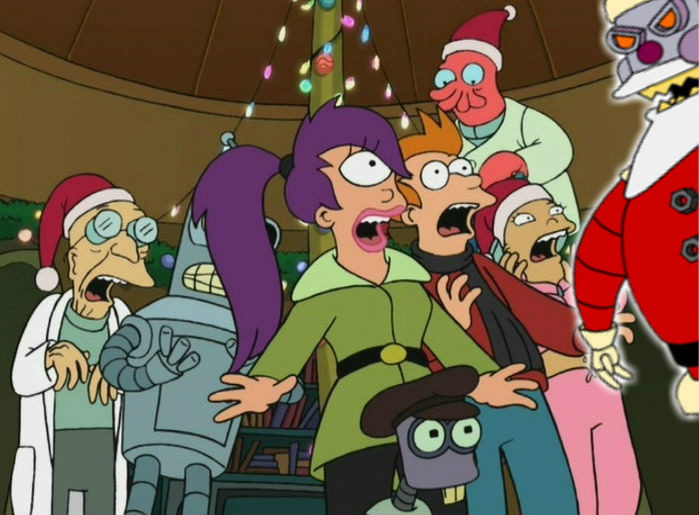 The employees of Planet Express are almost Robot Santa’s newest victims, but the evil holiday overlord is foiled due to the world’s purest source of niceness. Who is that beacon of purity, you ask? Why not Zoidberg? Man, the Henson Company can really teach a lesson. Christmas is many things to many people; some celebrate the religious aspect, others party with pals, while others dedicate the time to giving (and receiving) cool new toys. All of the ways to make Christmas your own have their own virtues, but when it comes to criticizing the reasons for celebration, the Fraggles point out that poking holes in the holidays is the worst way to spend the most wonderful time of the year. 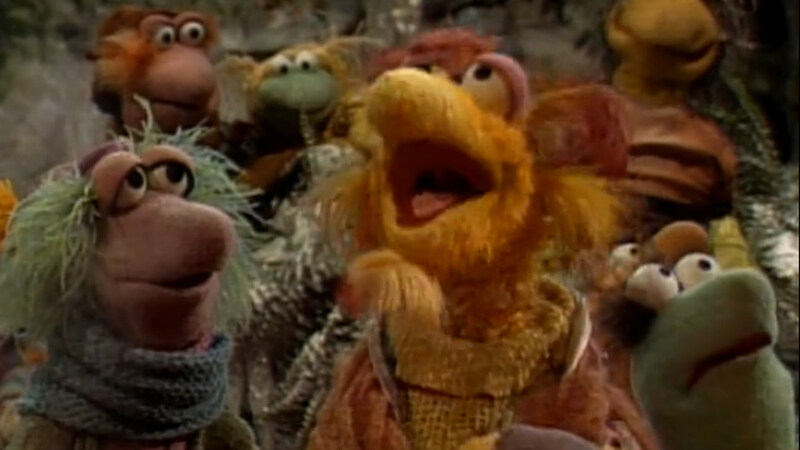 In Fraggle Rock’s “Festival of the Bells”, party pooper Gobo is focused more on disproving the reasons for the aforementioned holiday than spending the time with his Fraggle friends, including spiritual leader/coincidentally voiced by Jim Henson character Cantus. While on a mission to figure out if the giant bell rung by the Fraggles correlates with the continued movement of a giant rock (which would cause freezing temperatures if stopped), Gobo worries his friends, who end up freezing while waiting for their curious pal. Gobo returns to find his friends near-death, but is fortunately able to save his pals while learning the real reason for holiday celebrations; being with those you love… down in Fraggle Rock. Here’s a conundrum. In all of the bibles we’ve read, none mention dinosaurs hanging out with Jesus Christ (Sunday school would have been a lot more fun if that was part of the story). So on a show centered on the lives of prehistoric creatures, how do the Sinclairs convey the gravitas of Christmas on Dinosaurs’ holiday special? 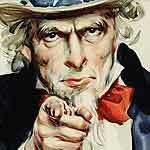 Easy, follow the other guiding light in our lives; the one inside the fridge! 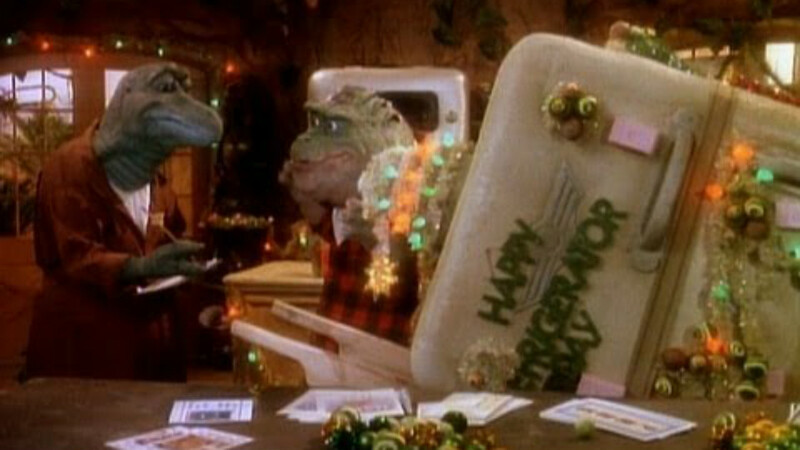 In “Refrigerator Day,” the citizens of Pangea pay homage to the fridge and the miracle it created (allowing Dinos to settle down and keep food fresh instead of scavenging). However, when Earl doesn’t get his bonus (Simpsons did it) and bills start piling up, the Sinclairs lose the meaning for the season when their fridge is repossessed. The family returns their gifts to pay the bills and still celebrates even when without material possessions, but a miracle occurs when the Sinclairs discover a true Christmas tradition and stores realize how lucrative product returns can be after the holidays. The Sinclairs celebrate and live peacefully until three years later when Earl dooms the species to extinction during the series finale. 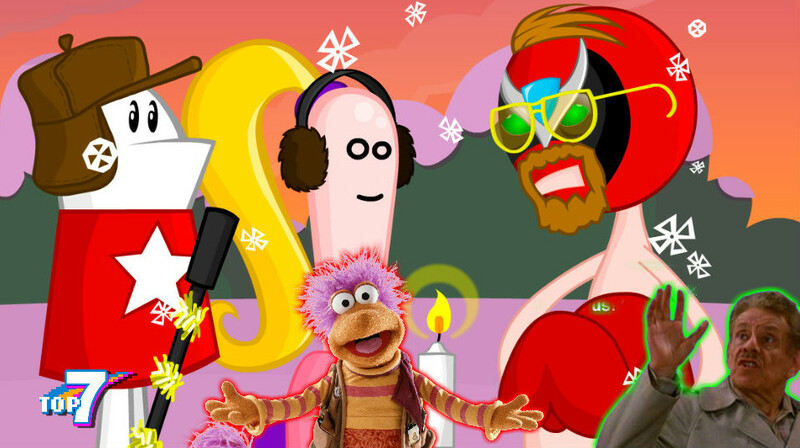 I love to see Homestar get any respect on here! 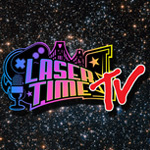 Could it be worthy of a podcast episode? Also, did Festivus become an actual thing akin to Pastafarianism? No Feast of Alvis from Sealab 2021? It’s basically the virgin birth story from Christmas but set in the old west times and the reason for the season is liquor and revenge. Happy Alvistime! Two number 5’s in a top 7?! HOW FESTFIVE!